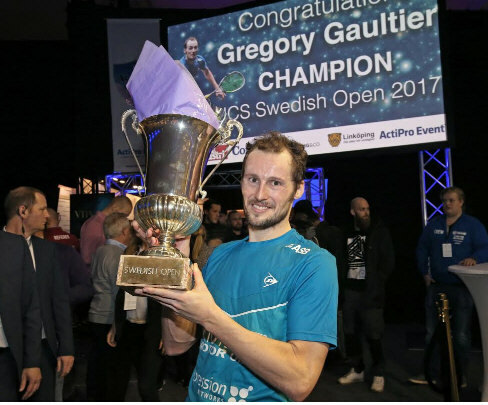 Gregory Gaultier claimed his third Swedish Open title as he came from a game down to beat top seed and defending champion Karim Abdel Gawad in ther final in Linkoping. Gawad pulled away at the end of the first game to lead, but the Frenchman was on top for the next three games - especially the third which he won 11-0 - and in just short of an hour's p[lay he aveenged his defeat in the ToC final, bringing Gawad's 19-match unbeaten run to an end. The Swedish Open final will be contested by top seeds Karim Abdel Gawad and Gregory Gaultier after they beat Alan Clyne and Simon Rosner in the semi-finals in Linkoping. Gaultier, the 2012 and 2013 champion, edged past Rosner in three close games while defending champion Gawad came from a game down to deny Clyne. The quarter-finals were cut in half in Linkoping as first Daryl Selby and then Mathieu Castagnet withdrew injured during the day, putting Simon Rosner and Alan Clyne through to the semis. The two matches that took place both went the distance as second seed Gregory Gaultier came from two games down to deny Tarek Momen, and top seed and defending champion Karim Abdel Gawad survived a marathon against Cameron Pilley.